Nestled among the skyscrapers several of downtown's most prominent addresses opened their courtyards for a sparkling preview of the Pittsburgh Vintage Grand Prix weekend's shows and races. 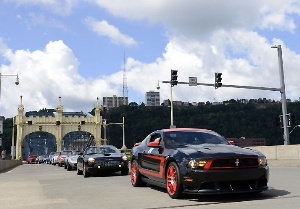 The Pittsburgh Vintage Grand Prix hosted a parade and 4 distinct car displays in downtown Pittsburgh. The parade started at Station Square, where cars will stage in the parking lot next to the Gateway Clipper. In 2013 this event netted nearly $15,000 for our charities!